Alterface Projects introduces its scalable Wander® solution, bringing interactivity to an unseen park-wide level during the IAAPA Attractions Expo (IAE) in Orlando. IAE is the largest conference and trade show in the world for the attractions industry. Wander® is the first distributed interactive solution for on-location entertainment. It is the latest addition to the growing family of non-linear interactive attractions, joining the recently launched Erratic® dark ride. The core of this solution is the dispatch centre which recognizes and assigns missions to visitors. Installed in various areas of the park, the action centres are the interactive locations where visitors will perform the mission assigned by the dispatch centre. Expect the unexpected Park visitors are given a mission individually or in group, and are sent to various places of the park to fulfil them. These places depend on the chosen story, on the available capacity of each station and on the previous experience of the players. As a result, they get missions that are changing all the time and cannot be predicted. In order to implement such complex and challenging system, Alterface relies on its powerful Salto™ interactive engine. This is the beating heart of, amongst many others, the hugely successful Maus au Chocolat in Phantasialand and Justice League at Six Flags. Salto has been further updated with the latest functionalities, which are also used in the cutting-edge Erratic® dark ride concept. The result is an amazingly flexible system, which can adapt to any venue regardless of its size and with a virtually unlimited amount of gameplay possibilities. Every visit to the park is turned into a new experience, offering a perfect tool to spread the crowd between attractions. In order to offer an affordable product, easy to operate and maintain, Alterface has selected interactive devices that only relies on ‘passive’ components. The Wander magic wand contains no batteries nor moving parts, it can be easily stored or even sold and returned for the next mission. The magic wand infrastructure is very flexible and supports multiple operational modes, offering a world of opportunities. Wander® will match the identity of the user with the unique identifier of the magic wand to create a truly personalized experience. It can operate as a standalone attraction or can be enhanced through interfaces with some visitor’s oriented programs such as season pass, loyalty card and local payment systems, amongst others. As far as the ‘play areas’ are concerned, the system also provides a lot of flexibility: the magic wand can reveal movements from animatronics, props and show elements. With the addition of Alterface image generators it can even turn into an enchanting on-screen interactive experience. Wander® in its most simplified form comprises stand-alone stations where visitors can freely interact, either with animatronics and props or with content. 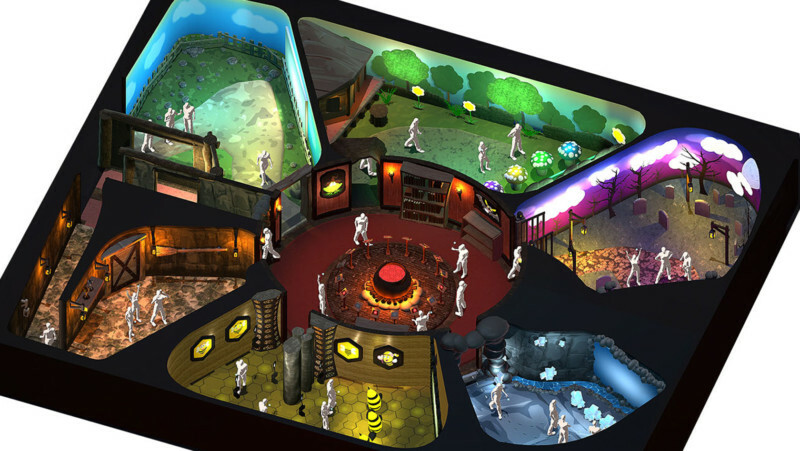 Their mission is to find the active elements within the park or the entertainment centre, based on a map they received or in a random order. There’s no need to log in or to hurry. The higher end version of Wander® is based on Alterface’s smart dispatching system. With this infrastructure, visitors are entering a totally new on-location gaming experience. Your park becomes the attraction. The Wander® system can be organized as a walkthrough experience within a building or any other location inside and outside. It is the ideal product to add interactivity in places which are not suited for traditional ride systems. Space is allocated based on an optimal visitor flow, maximizing throughput while securing an exceptional experience. Custom themes and devices can be developed to make sure this attraction perfectly fits the park facilities. Your park is no longer a collection of attractions, but becomes the attraction. Both Wander® and Erratic® are demonstrating Alterface’s intention to go beyond today’s way of interacting in rides. This can be accomplished by centering attractions more around the visitors, and by enlarging the places where it all happens, from a single room, to a building, a park and beyond. “Alterface will continue to lead the way by providing affordable solutions to fit every park’s needs and offer visitors a truly unique experience. As technology and communication further evolve, the industry needs to continuously innovate in concepts which optimize space and offer future-proof attractions.” concludes Benoit Cornet.